Maintain your fire alarms for optimal safety. Fire alarm systems are used to save lives every day. But they require regular inspection, testing and maintenance. The National Fire Protection Association (NFPA) and other code making organizations require annual inspection and testing as a way to ensure these systems will operate as intended to notify building occupants of fire or other emergency. Fire alarm systems operational reliability is only as good as the maintenance program used for inspection and testing. This is why regular inspections are essential. NFPA Standard 72, National Fire Alarm and Signaling Code, is the governing document for inspection, testing and maintenance of fire alarm systems. Chapter 14 provides a detailed guide as to the specific testing methods and frequencies for all components of a fire alarm system. This standard has been adopted by just about every state and local regulatory authority as law. This means that you must follow the inspection and testing requirements of NFPA Standard 72 or risk being in violation of local fire codes. 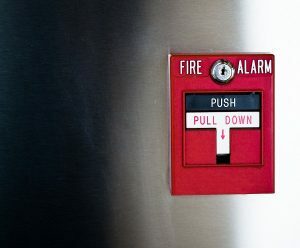 Generally speaking, building maintenance personnel not meeting one of the qualifications outlined above may not inspect, test and maintain a fire alarm system. However, it’s always best to consult your local fire marshal or other code official for guidance on who can and cannot legally perform these activities. Whether you need smoke detectors, fire extinguishers, or an automatic sprinkler system installed at your property, Fireline has you covered. We have been protecting people and properties from fire damage since 1947. Our experience shows in our excellent work, wonderful customer service, expertise, and reliability. For more information on how we can help your residential or commercial property, visit us online or call (800) 553-3405. For more fire safety tips, be sure to follow us on Facebook, Twitter, LinkedIn, and Google+. This entry was posted on Friday, August 4th, 2017 at 1:07 pm. Both comments and pings are currently closed.